The AquaHealth Reverse Osmosis System, Model RO 250, employs several proven technologies in a multi-stage design, providing premium water for all our beverage applications. 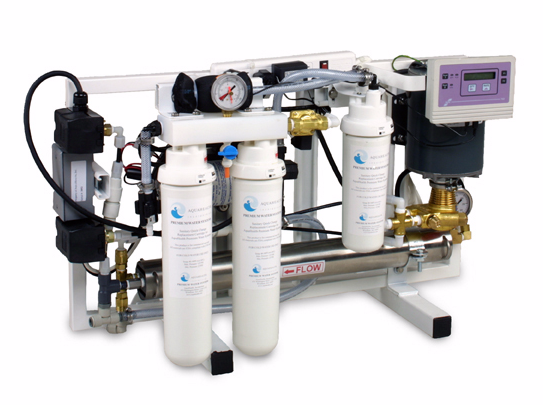 All AquaHealth filtration systems are customized according to your water quality, volume requirements and application. All of our components are NSF and UL approved, and are sourced from leading manufacturers. We use High Purity Micro-Filtration Systems for the majority of our domestic customers, and Reverse Osmosis when water chemistry demands it. *TDS (Total Dissolved Solids) is determined during the initial site survey reverse osmosis systems may vary depending on site survey and volume required.